In the last post, I provided the analysis results for the “C major scale” YouTube clip that I found. Here I will provide the results for the other two clips that I found and a couple of commercial instruments that I measured. I’ll start with the sound clips I found on the web. 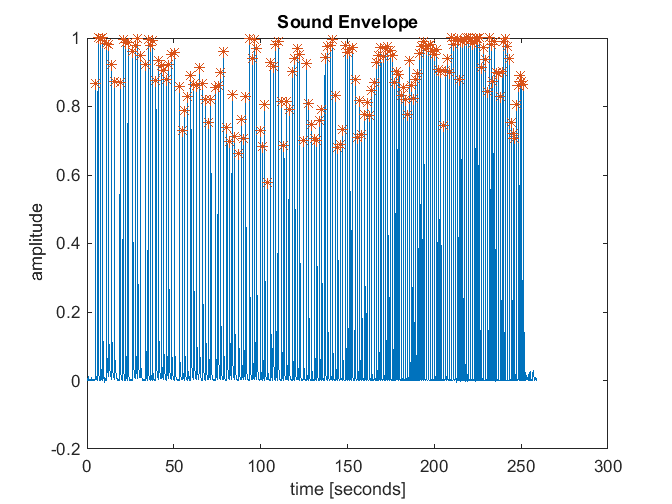 Below are the two performance plots for the DeMorrow sound clip referred to in a previous post. This instrument is in general a bit sharp with most of the notes in the range -2 to +7 cents. A few of the notes were played twice. 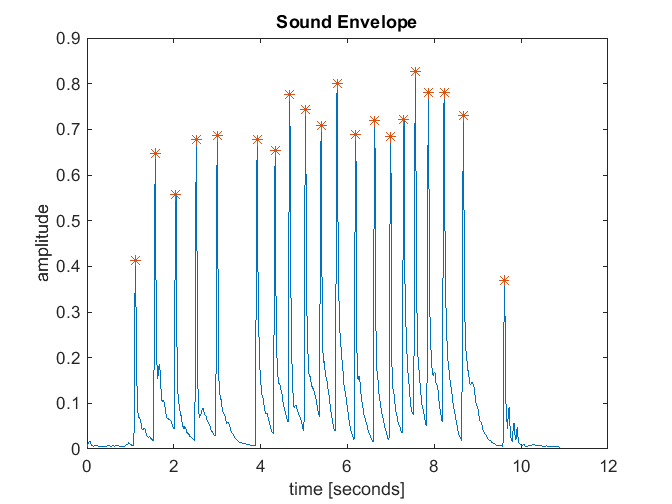 In that case the frequency error between the notes were within 1 cent, which was the desired resolution of the spectral analysis. The notes in the lower register of this instrument had 3rd partials that were close to the desired ratio of 6. 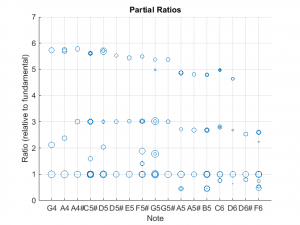 This is unusual as the 3rd partials for most instruments assessed tended to deviate from 6. 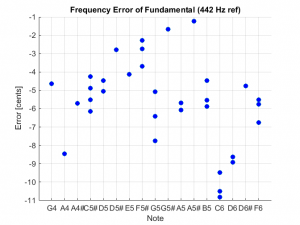 Below are the performance plots for the instrument recorded on the Oregon Symphony website. The tempo for this sound file was pretty high, so that the notes were not allowed to decay completely. 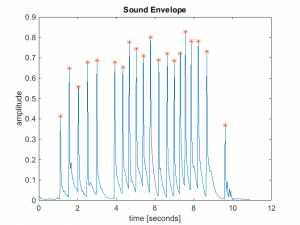 This resulted in generally short sound clips, which can result in poor spectral analysis results. 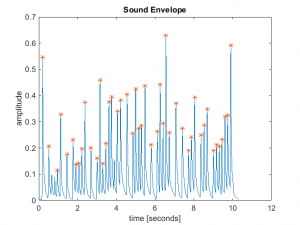 This may be the reason for the somewhat unusual results observed for this instrument. The 2nd partial ratios were generally good for the lower notes (below G5), but deviated from the desired value of 3 for the higher notes. The ratios for the 3rd partial were all below 6, and generally trended lower with frequency. 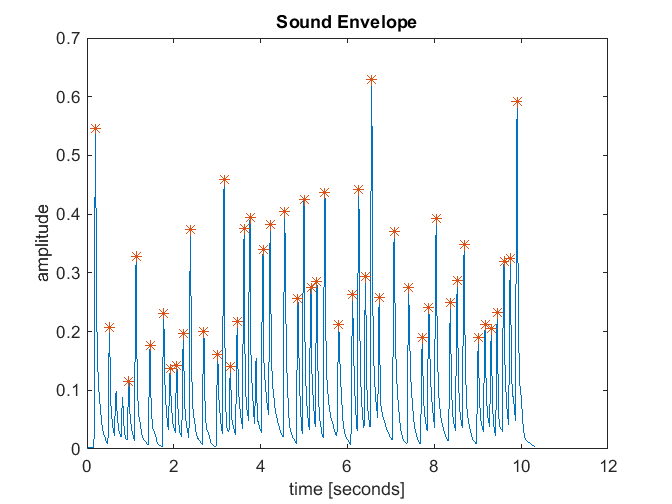 The instrument tended to be a bit flat, and had fairly high variability of about +/- 5 cents (about the mean). Because of the questionable quality of the web audio files, I also measured two commercial instruments myself. In addition to the improved audio quality, I was also able to control the cadence of the notes to ensure that the notes decayed completely. As expected, the results from the spectral analysis are much better. 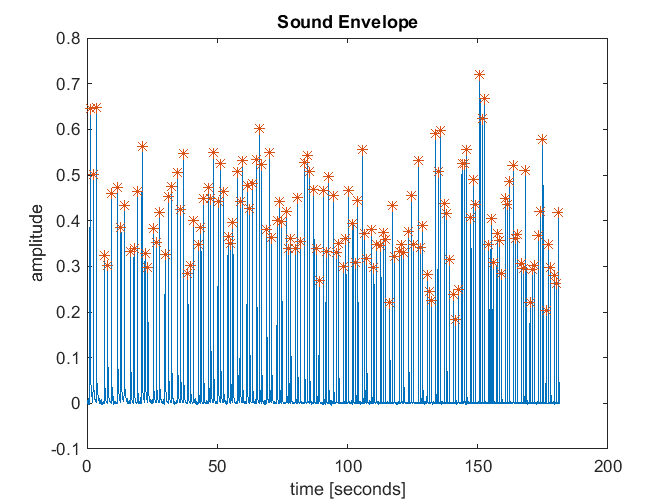 There were 176 discrete clips that were parsed, which is a result of each of 44 bars being struck 4 times. For bars C5 and lower, the 2nd partial is spot on. The ratio for the bars in the higher register tended to be sharp. No appreciable energy was detected in the 3rd partial. This may be because the bars were struck at their center point. If I were to record this again, I would strike the bars off-center; this tends to ring up more energy in the higher modes. The tuning was quite good. In general, the instrument was only about 5 cents sharp, and the variance was very low; most notes were about +/- 2 cents about the mean. The “clustering” of each group of 4 notes was very tight and only deviated by about 1 cent. 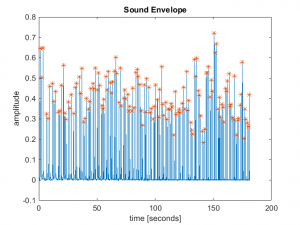 This suggests the measured frequencies really are quite accurate. I went down to the University of New Mexico (UNM) to measure a second instrument. There, Jack and I met with Scott Ney, who is a percussion professor at the college. Scott graciously provided access to the Kori instrument and helped us make recordings. This was beautiful 4 octave xylophone with Honduras Rosewood bars. Close up of Kori Rosewood bars. The recording technique was similar to the other, but this time, we struck each bar three times. 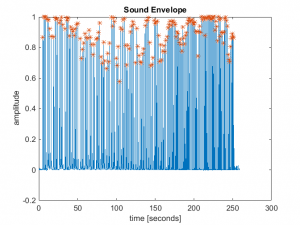 This recording had 147 discrete clips that resulted from striking 49 bars 3 times each. 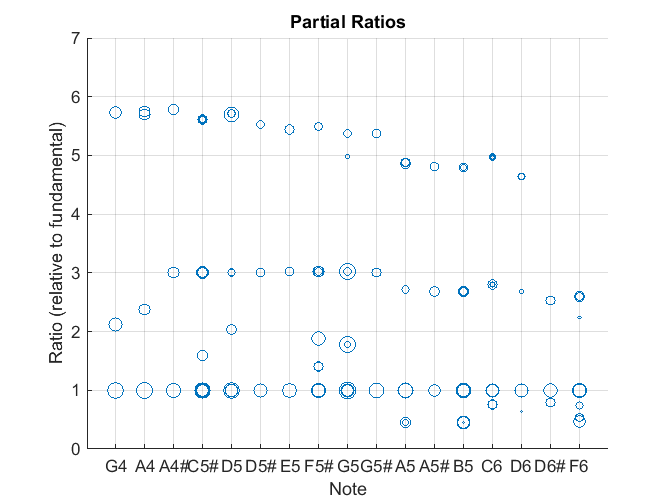 The 2nd partials were pretty consistent at 3 until about C6, when they started to go flat. 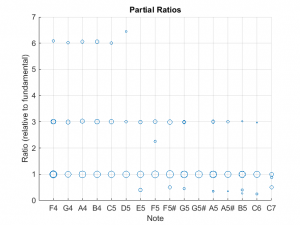 This suggests that it may not be possible to accurately tune the 2nd partials for the shorter bars. 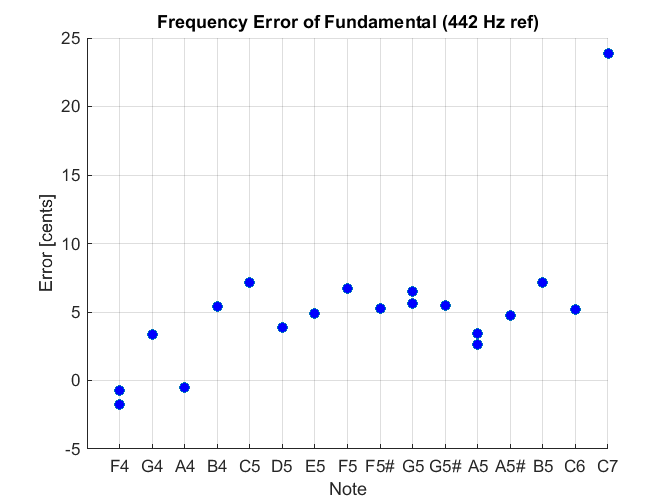 The 3rd partials were present, but the ratios wandered from >7 to less than six as the fundamental frequencies increased. The mean tuning of this instrument was very good, but the variance across the bars was large with a pk-pk error of about +/- 15 cents. (However, the spread was much smaller in the lower register, where the ear is most sensitive.) 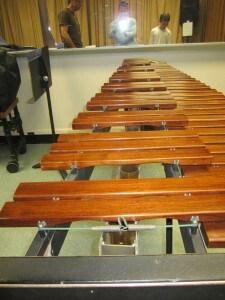 Scott said that the instrument was definitely due to be tuned, which was apparent from the results. Most of the instruments did a good job of accurately placing the 2nd partial at a ratio of 3. I concluded that carefully tuning this mode is both achievable and important. 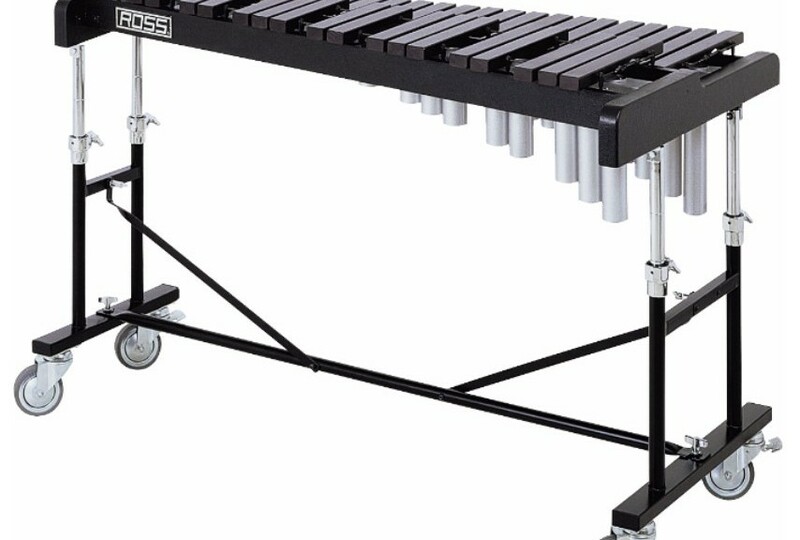 However, it may not be possible to accurately tune the 2nd partial for the shorter bars. The 3rd partial was not reliable across the instruments. Only the DeMorrow achieve 3rd partial ratios that were close to 6, and that was only for the bottom bars. 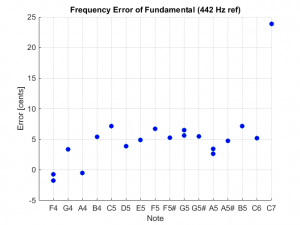 This finding, plus challenges in designing a bar with reliable 3rd partials (which you will here more about later,) suggested that I should not obsess over tuning this mode. 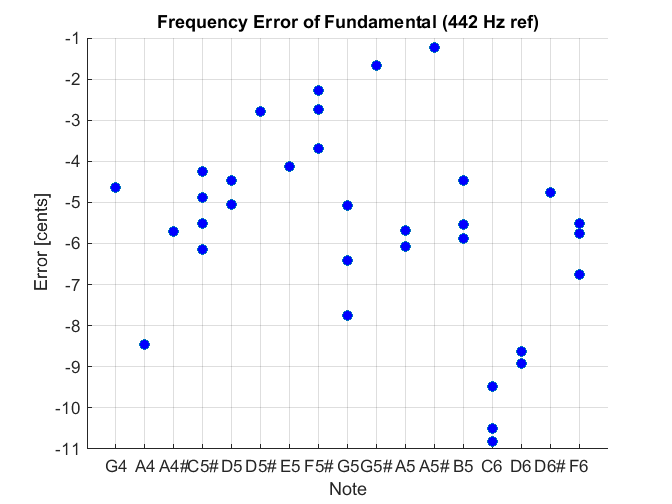 In general, trying to obtain good absolute tuning is desirable and achievable, but even instruments with fairly large frequency variance sounded good. Based on the findings, I decided to shoot for tuning accuracy of 2 or 3 cents. OK. Now I knew how accurate the bars must be tuned. In my next post I will begin to discuss how to determine the bar shapes.